out for a few years. 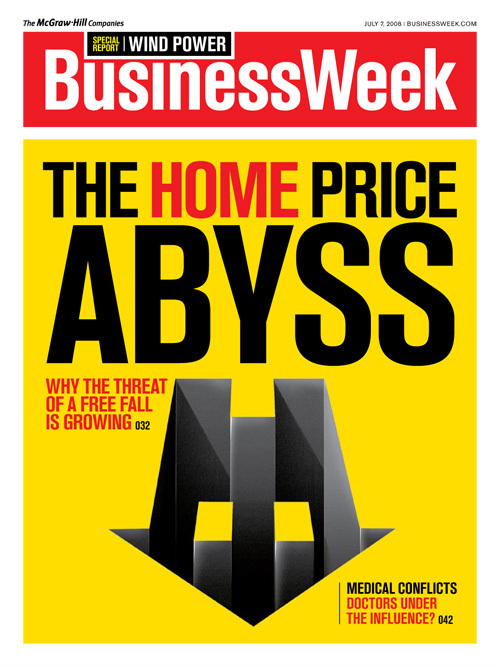 So notes an interesting cover story in BusinessWeek (June 26) titled The Housing Abyss. I must admit to being perplexed as to what meaning it has, if any. Recall then Time Magazine Housing Cover that pretty much top ticked the Housing market. Might this be doing the same — to the bottom? In its favor: Everyone knows housing sitnks, it is widely followed, and a tradable asset class. Against: BW is a business, not general interest publication — and there has already been several other Housing crash magazine covers. Regardless, they have moved to an outlook similar to my own — that we are nowhere near a ninth inning, and that this is likely to get much worse before it gets any better. Where they go somewhat astray is looking for more Congressional action. The housing crisis is entering a new and frightening stage. On June 24, Standard & Poor’s announced that the S&P/Case-Shiller 20-City Home Price Index had fallen more than 15% in April from a year earlier. Adjusted for inflation, the decline is the biggest since 1940-42, according to data collected by Yale University economist Robert Shiller. The entire piece and accompanying podcasts are worth your time . . .
Bespoke reminds us that BW had a similar cover back in January — and that Housing has gotten appreciably worse since then. Why wonder? Anyone with any financial sense can read this housing price chart by Robert Shiller and draw their own conclusion. The only thing is you have to trust Shiller’s methodology. I would love an updated version and have asked Barry several times to use his influence to get one. I wrote to Shiller’s office to no avail. I too think this will get worse much longer than most folks with access to the media seem to think…. By the way, my wife and I were just talking about the Barclay’s Bank excoriation of the Fed today….the Prudent Bear web site will get you to the article…. The only thing lacking in the article is renaming of the members of the Federal Reserve Board by various names like Curly, Larry, and Moe…..worth a read…. The unemployement hasn’t even started yet. People out of work can’t buy a house. We have several years to go still. Ask anyone that has gone thru a housing downturn. (I did in Los Angeles in early 90’s). Or just read Steve Barry’s posts. The guy has been spot on since January. BTW, Great day to daytrade. Enjoying a nice bottle of wine. As I posted before, 2 Million jobs by my estimation are directly related to the housing bubble. Every one of those jobs will be lost. The collateral damage to Wall Street, Detroit and the Starbux of the world should bring total job losses to a minimum of 4 Million before all is done. If we start losing 200K jobs a month, the bottom will be in about a year and a half for employment at best. I fObama gets elected, and the troops come home, that’s another 150K jobs needed. Think of the money that would be saved–or better yet–used to employ construction workers to fix infrastructure. Barry, the problem with the housing collapse is who will buy these houses? The Housing industry took up young people with Starter Homes, bad credit people with subprime and alt-a homes. You’ll have millions of families stuck with negative equity. The only ones with good credit with the cash are New Yorkers and they are getting outbid by the Eurotrash. housing must come down further, maybe much much further, and it will go below the trend line of growth on real estate as we will probably overshoot to the downside. I live in delaware, very near philadelphia, many of the burbs here carry average home prices of 350k-450k, if 50% are above that level it just doesn’t work. has anyone looked at what kind of rates you get right now on a jumbo loan? it’s not pretty, and more to the point, not affordable for most people, even when they are employed. It was easier the last few years because if you were smart enough you could have locked in at 45-46 year low rates on fixed interest loans. those days are gone. I also believe most people aren’t coming to the table with a big enough down payment on a 500k + home to get it below the 417 jumbo status. this isn’t even an argument about unemployment, plain and simple people can’t afford the homes, or now even the interest payments given the new lending standards and higher living costs. If you look at median income, even in my state, which is the 7th highest payroll in the country, the math just doesn’t work for most people. throw this on top of the fact than many places, at least around here, re-assessed values at the peak of the market for property tax purposes and it all adds up to house prices going down. one more thing to add to my post. I have a really hard time buying into the general comment that buyers are coming in that weren’t there before. People don’t have savings for that, the savings rate blows, and given where home prices have gone and the fact that average incomes have not gone up nearly as much to keep pace with the home price increases, that still keeps many people priced out. This argument might be true in some cities where the economic backdrop of the city is stronger (Dallas, Houston) but at the same time, home prices in these areas, from what I can see, are lower anyway, at least when I compare to where I live and the job market/economy is better. It is very difficult to see both of those being strong in most cities. Imagine if we were employing these 150,000 workers in actually constructive enterprises. That’s only $15B in annual wages, btw. This nation’s government is spending $700B on medical care and $800B on war/security/veterans. $1.5T! That’s FIFTEEN MILLION JOBS @ $100K/yr! As for home prices, compared to 2000-2002 they’re still pretty high in most places. Wages haven’t gone up since then (outside of DC, LOL) so bottom-calling is premature IMO. Because of who buys McGraw Hill product (e.g., magazine ads) they can’t declare DEATH OF EQUITIES or ABYSMAL HOUSING MARKET until it’s conventional wisdom…Same thing with network news holding-off on stories until they break elsewhere, or advertisers staying away from upstart websites. Plenty of opportunity in micro/small cap names. In the world of day traders; It’s comical that the STREET now follows the retail day traders. Some of these names have dropped 70-90% from 06 highs, and yet fundamentals have not changed and in some cases have imporoved. Once we were fully positioned, I’ll name names. Ask yourself this; how are the boyz going to make money in the future…..
Free fall? From 50% off prices? I think not. There comes a point where the rent/buy equation kicks in. Why do these writers ignore one of the biggest factors in the slowdown. Huge numbers of buyers were brought into the market for a time when you could get an 80/20 loand as long as you had a job and qualified based on income. Those days or gone. Down payments are required again. It will take some time to adjust. And for what it’s worth a just completed new home down the street from me just sold within one week of being completed and offerred for sale at full price (greater Microsoft area, WA) Inventory is slowly but surely being absorbed. Well financed builders are still starting new homes. Picture the housing boom as being on an overloaded freight elevator at the 60th floor, when suddenly, the cable snaps. As the elevator picks up speed, you find yourself wondering what’s under the basement. I see all these covers and can’t help but think that the bottom is here. I mean, yeah, I know, it isn’t. A lot of excess inventory has to be worked off and the credit mess and the recession and all that. In other words: is it possible to be in a housing recession, a bear market, and a credit crisis, and having housing sidetrack for awhile? What is going to sidetrack first as the indicator? Prices, sales, lack of foreclosures, what? Magazine cover indicators only work well after the fact. You simply choose the one (because there will be many) that’s closest to the time known in hindsight to be the agreed upon peak or bottom and voila: you’re a twit. 1) We all know about the magazine cover theory – it’s been trumpeted in the mainstream media and is itself common knowledge. It’s also been pointed out with multiple recent peaks/troughs, so it’s too much on sheeple’s minds. Everybody wants to game it. 2) The housing market moves more slowly than the stock market, so the normal delay that it takes the MSM to catch onto obvious trends wasn’t enough to make their awakening come after the reversal. If you want a magazine cover that will presage the nearing of the bottom, how about one with Angelo Mozillo in a striped suit? Guilty or not, his head will be made to roll. The magazine cover thing has been beat to death, I agree, but there are differences that make it clear which cover is “right”. What I mean is look at the past two good covers: Time magazine in like august 06 (or was it 07? I forget) saying “WHY WE LOVE HOUSING”. Look at the Business Week “IT’S A LOW LOW LOW RATE WORLD” in January 08. What made these covers important? That the rumor for awhile previous was that it was the complete opposite and yet no mag was reporting it. This time every mag is yapping their mouth off so the indicator is skewed… but… is not every mag covering the latest crisis the same as 1 covering a new crisis before it happens? Two sides of the same coin. Just watch out for the new mag cover. It’s not going to be housing or inflation or credit as those have already been covered a million times over… it’ll be something else. >> If you want a magazine cover that will presage the nearing of the bottom, how about one with Angelo Mozillo in a striped suit? Countrywide is trading Mozillo to the YANKEES? It’ll never happen. I like the subtle hint that housing has overshot to the downside! Ha Ha Ha. It has not even reached the usual equilibrium point. US housing needs to go down another thirty percent merely to return to long-term averages. Factoring in inventory, indebtedness, wages, inflation, and lending standards, I would guess we need to plumb record low Price-Income ratios for a few years before we can contemplate flattening. Additionally, much of the commentary, even by the bears, is implying a V shaped market. As if housing will drop 50% and then magically rise 20% a year for the following ten years. Bingo — BW has been a good cover indicator for Wall Street merchandise — stocks, bonds, commodities. But housing is a consumer good, best contrarily signaled by general-interest magazines (such as the near-perfect Time cover). Best guess here is that the BW cover may be providing a 6-month warning for a housing bottom. Sure, the decline has farther to go. Most of the commenters here are emphasizing how much farther, while there’s hardly a peep about bottom picking. That in itself is bit too bearish. Crashes at double-digit rates — whether in stocks or housing — usually aren’t sustained for more than a year or year and a half. The downside plays out a lot faster than the upside, usually in about one-third the time. Nobodies mentioned what happens when local municipalities see their tax base evaporate. this is the real issue IMO, local governments as well as the federal government are going to be broke! So much for the infrastructure save. The holidays are not going to help either. Last year sales were poor and, if oil stays where it is now, this year will be worse. My family is already talking about skipping the gifts this year, not just for Xmas but for birthdays too… many in my family are barely getting by paying for higher gas and food, forget about when they have to pay to heat the house too. There will be lots of families skipping the gifts this year. Before housing can even consider a recovery, there first must be institutions willing to make home loans and hold those loans as securitization of ABCP has died on the vine. Banks now are in search of new capital, not new assets. Balance sheets are being reduced. Maybe in time some of the smaller regional banks can resume their traditional role of mortgage lender, but first we will have to see which of them fails over the next two or three years. There simply isn’t a great supply of pristine creditors who have a 20% down payment and who don’t already own a home. And there is about a 10-month inventory of homes on the market. High supply, low demand is not an equation for recovery. Said before, I’ll say it again: a bursting bubble is not the same thing as a cyclical downturn. Housing is NOT going to ‘bottom’, it is going to return to normal. The difference is huge. The word ‘bottom’ carries an implication of ‘recovery’. A burst bubble does not ‘recover’. Bob – exactly. We’re nowhere near that, however. The key is the county appraiser — whose job depends on maintaining the 2006 or 2007 tax values. Until the COUNTIES are willing to assess properties for tax purposes at what their purchase value is, residential RE is dead.. because all “equity” profit evaporates when yearly tax is based on the mega-bubble top instead of the market-clearing (50% lower) value. I’m 30. I’ll buy a house only when I can make money – and not a second before. Maybe in 2013! Wow! The degree of consensus here is stunning. The March 21st 2005 Newsweek cover story, “The Incredible Shrinking Dollar,” marked a key contrarian turning point in the greenback’s fortunes. (The dollar has rallied 7% versus the euro and 2% against the yen since then). Did anyone forget that other BW cover? Sorry, the “IT’S A LOW LOW LOW RATE WORLD” was January of 07, not 08. Duh. Sorry buddy I was a little tipsy last night. My prior post didnt come our the way I meant it. I was referring more to the R.E. market in general. I know how you feel about the housing market. We are in agreement. Look at the Shiller charts since the 70’s. Each rise and fall of the inflation adjusted price follows a nice bell shaped curve. Overall time span for first bump was about 7-8 years, next was about 10 years. This housing bubble began in 1998, and peaked in 2006 (8 years to peak). The downfall thus far is following the bell shape nicely. Thus, add 8 years from the peak of ’06, and you get a bottom date of 2014. The risk for the financial system and the economy is that the price drop, already horrifying, will start feeding on itself. When home values fall low enough, hard-pressed homeowners become less able or less willing to keep paying their mortgages. January 18, 2008 Fox Business Channel Market Top ? Welcome to the Second Half!